This vessel is a sleek 57' sailing catamaran that will carry you at a high speed driven by the tradewinds and the sails themselves. The point of this trip is to relax, put your feet up after a crazy morning or a late arrival into Nassau, and just "feel the wind". For your comfort, there is an inside cabin, should you wish to take a break from the sun. 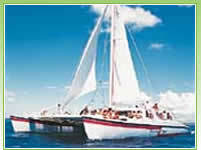 Sail to a secluded beach where you can swim and snorkel at your leisure or relax on the beach. Cool off with refreshing tropical drinks. Two beverages, a Rum Punch and a soda are included in the cost, as is ShoreTrips' service fee. Taxi and Transfers Required - Specific pick up or taxi instructions will appear on your voucher after you purchase your trip. Bring swimsuit, beach towel and sunblock. 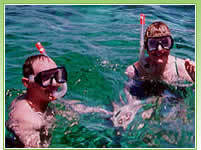 Snorkel equipment and complimentary soft drink or rum punch included. Allow at least 15 minutes for the cab ride. Check in 15-20 minutes prior to departure. Make sure the trip times work with your cruise schedule. Afternoon trip does not return until 5:30pm. This trip is not available on Good Friday, Christmas Day or New Year's Day. April 9 - Easter Monday 0930 tour only.